Spending time with a family of mountain or lowland gorillas can be a life-changing experience. Tourism in the remote rainforest areas of Congo, Uganda and Rwanda in East Africa contribute directly to protecting these critically endangered species and the conservation of their habitat. The experience requires a fair fitness level as you will be hiking in humid conditions through thick vegetation and along steep, at times rather muddy, mountain tracks. Clothes and shoes should be appropriate for these conditions. 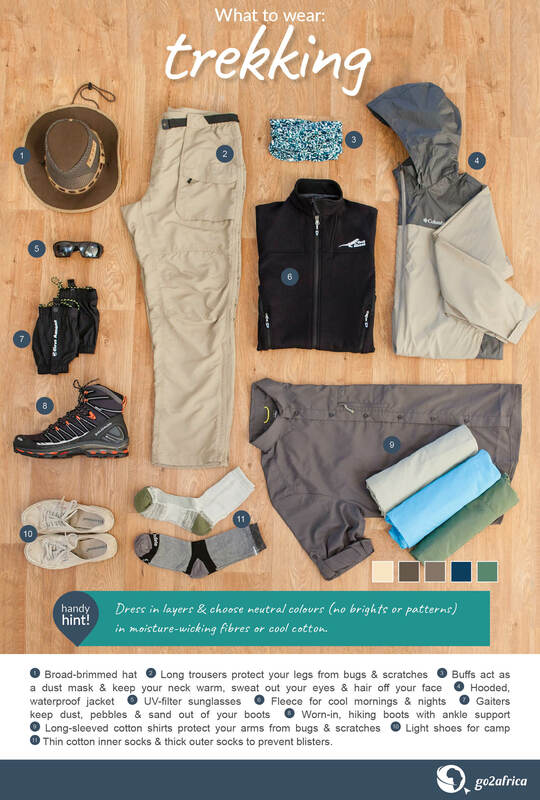 This handy infographic will give you an idea on the best types of clothing to bring for your gorilla-trekking experience. As always, dress in the colours of nature so that you blend in with your surroundings. Go with greens, greys and browns in lightweight material that wicks moisture. Avoid camouflage – it is illegal for civilians to wear in many areas. Do not wear animal print as the gorillas may become alarmed at seeing a ‘leopard’, for example. Although it will be hot, wear long-sleeved shirts and trousers. Some vegetation may be prickly, and covering up your arms and legs will save them from scratches and bugs. Some trekkers wear gardening gloves so they can grab onto plants and branches for support without worrying about hurting their hands. Bring the most supportive waterproof boots you can find. Treks can be up to eight hours in mud, making ankle support and grip imperative. Thin moisture-wicking socks covered by thicker cotton socks will help prevent blisters. Dress in browns, greens and greys, and wear trousers and long-sleeved shirts. In some areas, your guide will hand out disposable masks as gorillas are susceptible to human diseases. Although not essential for all, trekking poles are great in providing extra balance and support. Do a few practise hikes at home first as they take some getting used to. Invest in a pair of gaiters to keep water, stones, mud and sand out of your boots. Knee-high ones will keep the bottoms of your trousers dry. A Camelbak water pouch will allow you to sip water while keeping your hands free. Be sure to keep hydrated, especially at altitude. If you are offered the option of a porter to carry your pack, please consider employing (and tipping) him. Many porters are reformed poachers and rely on the income from trekking to support their families (and not slip back into lucrative poaching). Expeditions are led by professional guides and trackers, and finding a family group can take anything from about two to eight hours. You will not be left behind or expected to move at a very fast pace – your guide will stop regularly to allow you to rest and refresh. Once you find a family, you will spend 40 minutes to an hour observing from a safe and government-mandated distance away. Be sure to take pictures (without a flash or loud mechanical sounds), and then allow yourself time to enjoy watching their very human gestures, interactions and emotions. Gorillas that are habituated will tolerate human presence but it is important not to disrupt or aggravate the group with obtrusive movements, noise or eating. Be prepared for plenty of insects – standard in any rainforest environment but well worth the trouble to see gorillas and be in such a pristine place. Dress comfortably and try to blend in as much as possible. 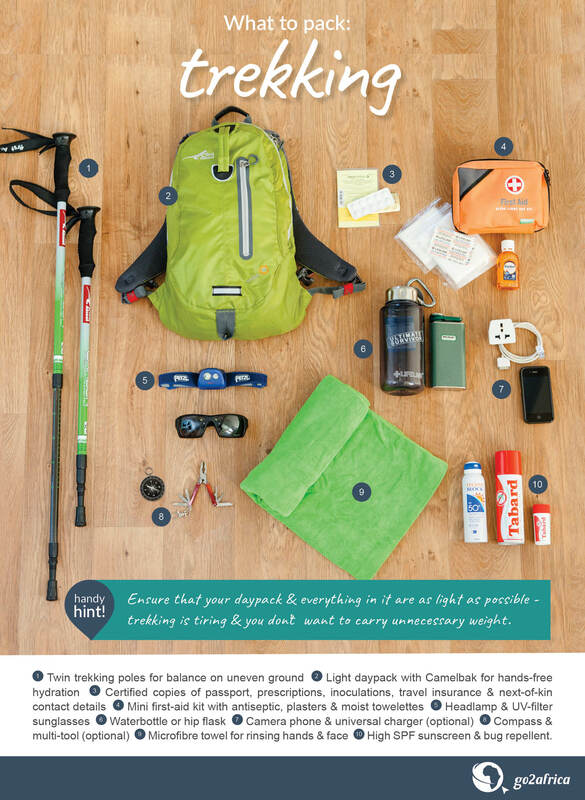 Pack as lightly as you can. You may have to take a light aircraft to get your lodge or camp, which will have strict baggage size and weight limits. If you are going elsewhere after your gorilla trek, ask your African Safari Expert to make arrangements to have your extra luggage stored safely. A mother and baby move through the Congo rainforest, one of the last places on earth to see mountain gorillas in their natural habitat. Want to know more about Africa’s secret places and incredible wildlife? Sign up to our newsletter for insider info on African travel. If you’re ready to start planning your dream safari, get in touch with a friendly African Safari Expert today.